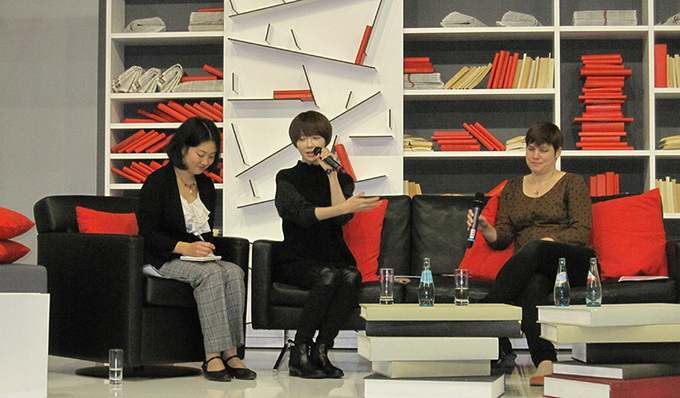 The Japan Foundation sent author and playwright Yukiko Motoya to attend the 66th Frankfurt Book Fair held in Frankfurt, Germany, in October 2014. At the fair, over a period of two days, Motoya performed readings of her short story Tomoko no Baumukuhen (Tomoko's Baumkuchen) and conducted dialogues with Lisa Mundt, a researcher of Japanese theatre at the Japanese Studies Department of Goethe University Frankfurt am Main. 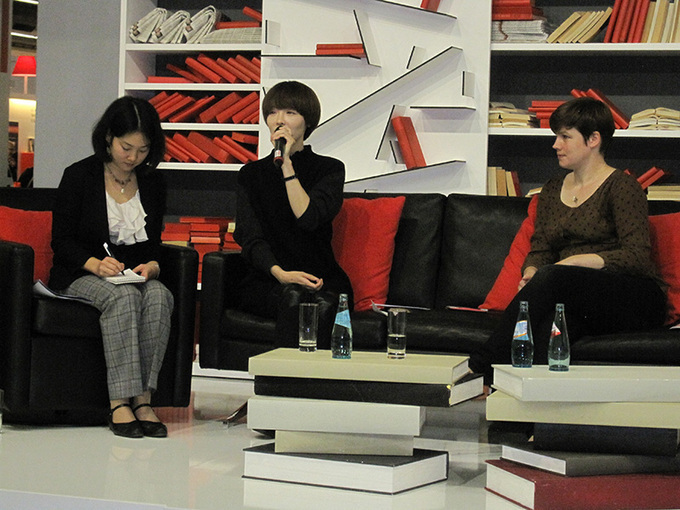 In Germany, the theme of Japanese women attracts great interest, and engaging Q&A sessions were conducted on this topic at the reading events. In this essay, Motoya reminisces on the interaction with German readers that she experienced through the readings and the dialogues. The audience that occupied all seats at the venue opened the distributed pamphlet, and began reading silently as they listened to me with great attention. The tiny pamphlet, which was only a few pages in length, contained the full text of my short story Tomoko no Baumukuhen, which was translated into German especially for this occasion. I read it in Japanese, exactly as it was initially published in a magazine. Once I had finished reading up to a certain part determined in advance, my dialogue partner, Lisa Mundt, would read the same section in German. The previous day, Lisa and I had just completed a reading and dialogue event with the same content at a nearby Museum of Applied Art. The audience that attended the museum event consisted mainly of elderly people who had great interest in Japanese literature and listened to our reading with surprising enthusiasm and zeal to its very end. The event on the second day, however, was scheduled to take place in a corner of the Frankfurt Book Fair, one of the world's largest events of its kind. Moreover, the stage of our performance was the open space right next to the cluster of booths representing various countries. We made the most of the self-examination of our performance on the preceding day and revised the structure of the reading to improve its rhythm and thus reduce the length of the sections that contained words and expressions that were difficult to comprehend. Yet, the audience was quite fluid and would immediately leave even at the slightest stagnation in the flow of the reading. Against this backdrop, I completed the reading of Tomoko no Baumukuhen while stealing glances at the remaining listeners and wondering what kind of a story they wished to hear from a Japanese author who has not even been published in Europe yet. In the middle of the program was the dialogue. For this part, Lisa had prepared detailed and specific questions in advance, so all I had to do was respond to them just like I had done the previous day. However, I was aware of the fact that I was addressing living human beings. It would not go that smoothly. Influenced by the mood of the audience, the talk gradually began to wander. For instance, the previous day we had elaborately discussed the feeling we experience when something that we are used to seeing suddenly appears completely new and scary if we look at it for too long. Yet, at the venue we got influenced by the overwhelming atmosphere of the live performance and, before we knew it, the dialogue had shifted to the way all sensation seems to leave our bodies. Tomoko no Baumukuhen is a short story about an ordinary housewife who, early one afternoon, realizes that a thin membrane covers our entire world. I spoke how "since the living body cannot sense it, the whole world that surrounds Tomoko suddenly appears to her as an unfamiliar and strange place." At that point, I received a question from the audience whether that sensation was specific only to Japanese people. This question somewhat bewildered me, because the previous day I had been asked a similar question. An elderly lady asked me whether or not this sensitivity was specific to Japanese women who have to keep their opinions to themselves. But is that really true? I have never lived outside Japan, and can only imagine what people from other countries feel about different things. When I read foreign novels, I often enjoy the cultural shock caused by the broad difference with my own values and ideas, but were the questions the audience asked me actually a confirmation of whether they could interpret my writing in a certain way? Did they really want to read it that way? With my answers, I conveyed that it was never my intention to limit my writing to the perceptions and sensitivity of Japanese people alone and urged my audience to use their imagination without setting boundaries. I was concerned whether they understood me, but it appeared to me that they took the words of the Japanese writer standing in front them quite seriously. I believe this is the true power generated by mutually opening ourselves up. Forging connections through novels is also important, but in reality we do not know much about each other. Wondering what kind of person wrote the story can also spur the interest of the readers. 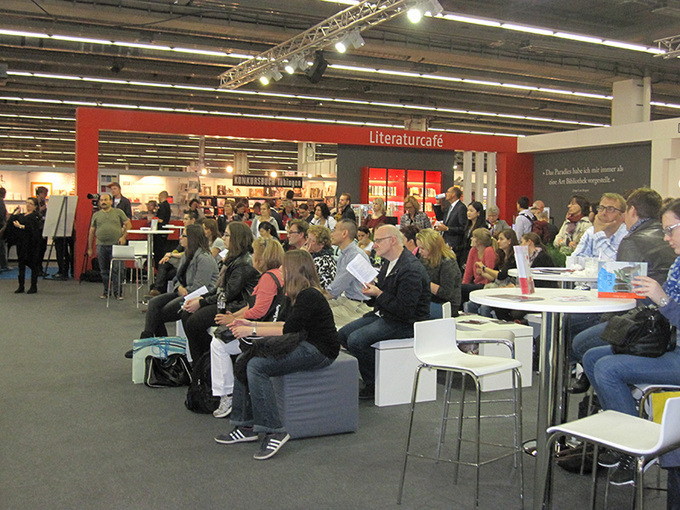 My visit to Germany was very short, but for me it was an extremely interesting and gratifying experience in observing the "body" of readers of novels from all over the world. Yukiko Motoya was born on July 14, 1979, in Ishikawa Prefecture. In 2000, she founded Gekidan, Motoya Yukiko, whose plays she both writes and produces. In 2006, she won the 10th Tsuruya Namboku Drama Award for her play Sonan (Distress), becoming the youngest playwright ever to win this prestigious award. In 2008, she was awarded the 53rd Kishida Kunio Drama Award for her play Shiawase Saiko Arigato Maji de! ([I'm] Happy, [This is] Fantastic, Thank you, Really!). Motoya is also active as a novelist, and in 2011 her novel Nurui Doku (Warm Poison, Shinchosha Publishing) won the 33rd Noma Prize for New Writers. In 2013, her story collection Arashi no Pikunikku (Picnic in the Storm, Kodansha) was awarded the 7th Kenzaburo Oe Prize. Her latest novel, Jibun wo Suki ni naru Houhou (For Six Days of Linde, Kodansha), won the 27th Yukio Mishima Prize in 2014.